Welcome to my Facebook shop! I'm Myra Schwartz, a longtime US kidney patient, transplant recipient and jewelry designer. In 2002, before receiving my transplant from a cousin, I began searching for a special gift of gratitude to present to her...but what is an appropriate gift for someone who gives you the Gift of Life? I knew that it had to be meaningful and symbolic of our journey together. Unable to locate anything worthy of this extraordinary gift, I made her a piece of jewelry with a sterling kidney. I then wondered if other recipients were also looking for ways to show their appreciation to their living donors, doctors and family members. I began a small website to test the waters. It quickly became apparent that recipients around the globe were also searching for meaningful gifts for the special Heroes in their lives. I design many of the pieces on my site and work with a studio in Bali to produce the sterling silver pieces. I also commission other artists to create kidney shaped items for my websites. Searching for vintage kidney pieces is also an interest of mine. I seem to have a radar for kidney shapes and often find jewelry and objects at antique markets and estate sales which I offer on my websites as well. Each item I post for sale is meant to be a small reminder that life is about gratitude, hope, love and continuity...a talisman of sorts. The transplant experience is a profound one, full of wonder and grace. I offer gifts of quality that I believe symbolize the importance and significance that transplants represent in our lives. I hope you feel the spirit in these pieces and will be proud to wear them or present them to your transplant Heroes. Here's wishing you all the best of health! 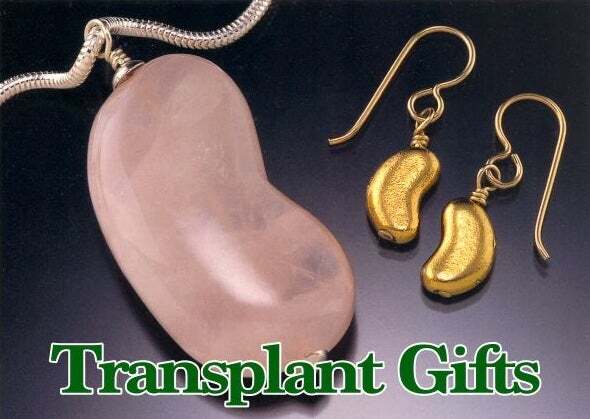 Please view the entire collection of gifts at main website, TransplantGifts.com OR KidneyJewelry.com to see over 100+ items. Most are kidney related, but I'm expanding into other organ shaped gifts, by request. There isn't a shopping cart on that site yet, so just ask for a paypal invoice from there. Checkout on this page, however, is a breeze and will take you directly to Paypal from this shop with 25 of my newest and best selling items.. Here is a summary of where you can find my jewelry, both kidney shaped and my wearable art non-kidney shaped.